The best way to go to the hilltop Cebu Provincial Detention and Rehabilitation Center, a maximum security prison in Cebu, is by motorcycle taxi (habal habal) from either the Capitol or Sudlon. Car taxis claim they can't make the trip because of the gasoline involved going up the hills. My Filipino friend Debrah and I paid 100 pesos each ($2) for the 10-minute up the windy and narrow steep road. When we arrived at the prison, Debrah inquired and found out that the show actually starts at 2:00. Registration begins an hour before. At that hour only the most devoted wives and girlfriends had showed up, each schlepping food for their boyfriends and husbands inside the prison. We were the first tourists, followed by two Japanese girls who are studying English in Cebu because it's so much cheaper than in the U.S. or Australia. Many of the prison wives came with young babies. Debrah found out that they are allowed to spend the night with their husbands in prison. This little girl first visited her daddy when she was 4 days old. With a couple of hours to wait, we decided to "kill" time by walking around the neighborhood. Across from the prison is the Cebu City Jail Male Dorm. Dozens of inmates were looking down from their cells, probably searching for visitors. In California, this would be a rich neighborhood. We Americans love a nice view. However, in the Philippines the hilltop prison and jails overlook ghetto homes. Around the back of the men's and women's jails is one for minors, ages 15-17. It's called "Cebu City Operation Second Chance Center." I found out that 185 boys and 20 girls were currently locked up. Children younger than age 15 are sent to Department of Social Work and Development instead of jail. To register for a free visitor's pass you write down your gender and nationality. I'm not sure what's the maximum number of passes for each performance, but on this day it definitely wasn't necessary to line up two hours early. Even a group of nuns came to see the show. Last year when Pope Frances visited the Philippines, the Dancing Inmates did a special performance in his honor, even though Cebu wasn't on the Pope's itinerary. This year in January one of his cardinals did attend and expressed his love and encouragement for the Dancing Inmates. Other tourists also took selfies in front of the jail and the prison gates. As a joke, I played dumb and asked this motorcycle driver what type of plant he had on his cap. He took it off and looked at it, shaking his head. He seriously didn't know. So I told him it was marijuana, which seemed to amuse him. I think he likes it because the green matches his t-shirt. Waiting in line to visit their husbands and boyfriends. The family members definitely outnumbered the tourists. Of course, I had to get a t-shirt, even though 350 pesos ($7) is much more expensive than most souvenir t-shirts in the Philippines. While we entered the prison, the inmates were milling around, visiting with family members and kids, and shooting baskets. I noticed that these guys were in better shape than the average Filipino man. I'm guessing it's a combination of dance rehearsals (no longer mandatory), basketball, and limited diet. Or are crimes committed more often by athletic men? More tourist selfies. Most of the tourists were from Japan and Korea, but some Americans and Europeans too. Several of the men had their arms around each other as they walked around the prison yard. Again, I'm guessing, but I assume it's a sign of camaraderie, rather than gay relationships. Or I could be wrong. These Danish students are doing an internship on public health in the Philippines for 6 months. This inmate has watched the Dancing Inmates once a month for 6 years, so maybe 72 times. I didn't ask about her crime, and she has no idea when she'll get out. She said she doesn't participate in the dancing because of high blood pressure. The other women were her guests, who said they were staying the weekend. The woman in the green t-shirt is the prisoner. The others are her visitors. The seats in this pop out were reserved for VIPs, but a few of us foreigners sat on the platform to get better photos. The Philippines is proud to be the only Christian country in Asia. 86% of Filipinos are Roman Catholics, so they begin with a prayer. All shopping malls offer mass on Sundays too. The Philippines National Anthem is played after the prayer. 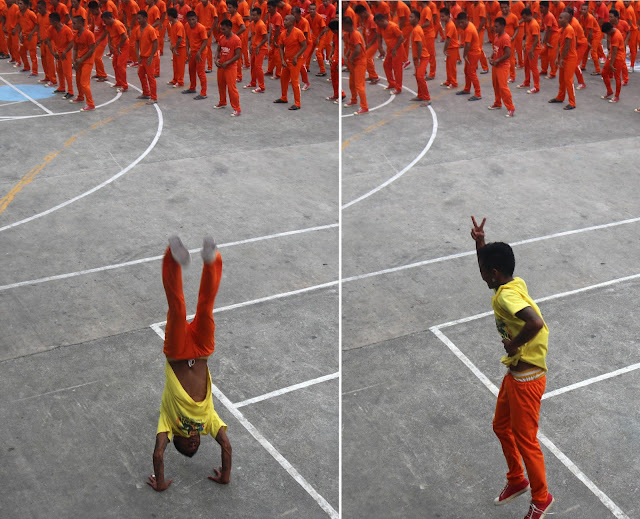 The inmates with yellow t-shirts have been selected to be the featured dancers, based on skill and enthusiasm. Although this looks like a religious cult, it's just part of the choreography. Birhen Sa Fatima is Cebuana language (also called Bisaya) for Virgin of Fatima. As a big fan of the Netflix series, Orange is the New Black, I was especially interested in the female inmates. The ones in white shirts are the best dancers. The warden who came up with the idea of teaching the inmates to dance is a big Michael Jackson fan. Within 24 hours of Michael's passing, the Dancing Inmates organized a memorial performance in his honor. 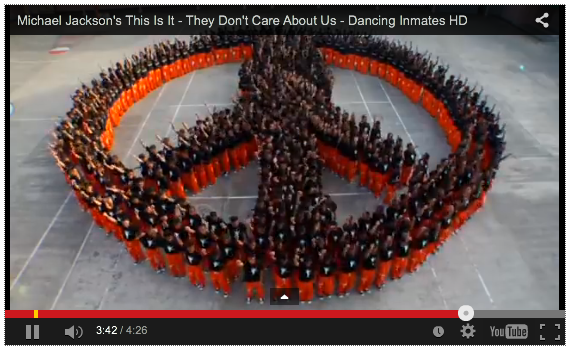 Here they're forming a huge peace sign to "They Don't Care About Us," a very powerful Michael Jackson song originally filmed in a prison and also in Rio and Bahia, Brazil. I couldn't stand up in the middle without blocking other people's view, so I couldn't get this angle. However, I screen shot it from "They Don't Care About Us," when Michael Jackson's choreographer and two of his dancers traveled to Cebu to film this for Sony's "This Is It." The female inmates joined in on several numbers. Biggest hits by the Dancing Inmates include Gangnam Style, Dangerous, Jump, Twerk It Like Miley, Thriller, They Don't Care About Us, and anything by Queen. This talented young man flipped numerous times across the concrete. They invited the tourists to join in on the last dance. Making a fool of myself. But the prisoners don't even notice. They do this every month. I also heard that they know that if they even touch one of the visitors they'll be in big trouble. Few people took photos of the female inmates, but being a big fan of Orange is the New Black, I couldn't resist. I'm just average height in the U.S. but I feel like a giant in the Philippines. Time to leave the prison. Three separate prison guards checked our wrists to be sure we had the hand stamp that they gave us on the way in. Even with the crowd there were plenty of habal habal drivers waiting to give us a ride back down the hill. Pretty cool. What a great opportunity while waiting in the Philippines!